As Christmas rapidly approaches, there's a surprisingly popular gift making the rounds: tech stocks. 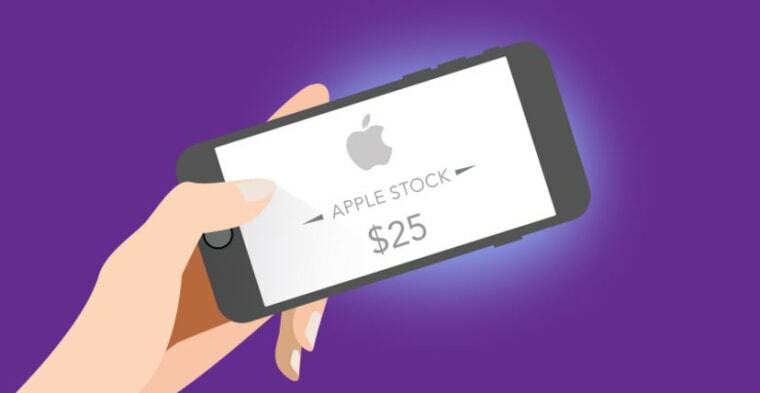 Stockpile, a startup that sells stock in the form of gift cards, is seeing a spike in demand for shares of Apple, Alphabet, Facebook and Tesla. The cards just hit stores in October and have proven so popular that retailers have quadrupled their orders from an initial 1 million, said Avi Lele, CEO of the San Francisco-based company. Check out the plastic card racks at your Kmart, Safeway or Wegmans, and there's a good chance a display featuring a $25 card for Apple stock will be right near the Best Buy and Applebee's gift cards. It sounds so obvious — what took so long? Stock prices are constantly changing and don't lend themselves to the clean $25 and $50 denominations that are great for books, movies and meals. For example, one share of Alphabet (parent company of Google) sells for over $750, while Tesla is over $200 and Apple andFacebook top $100. To enable gifting, Stockpile had to develop technology around fractional shares, so that a $25 Tesla card would allow for ownership of less than an eighth of a share. Additionally, Stockpile worked through the regulatory process to become a registered broker. "We did a lot of work to get all the pieces in place to have a consumer product at a price point that would be of great value, that would be sound with regulators and could get distribution where people are in their daily lives," said Lele, who was a lawyer for over 15 years before co-founding Stockpile in 2011. "Normally you go to a brokerage if you want to buy stock. Here, we come to you wherever you are." In retail stores, Stockpile sells cards for 20 different companies, including non-tech brands like Starbucks, Walt Disney and Pfizer as well as exchange-traded funds for gold and the major stock indexes. It also has a card that allows consumers to choose their favorite stock. Cards come in $25, $50 and $100 denominations. The buyer also pays an additional $4.95 to $7.95 charge to cover interchange, brokerage fees and the costs of stocking the card. For gifters who want to pay lower fees and don't care about the physical card, Stockpile also sells e-gifts, which cost $1.99 for cards $100 and under. That option has the added benefit of offering about 1,000 available names. To turn the gift into actual stock, the recipient goes onto Stockpile.com, creates an account and enters the code. From there, the account can be used like a typical online brokerage, only buying and selling stock costs 99 cents per transaction compared with $7.99 at E-Trade and $8.95 at Charles Schwab. Stockpile is among a new crop of companies applying technology to investing with the goal of bringing down fees and opening the market to a wider swath of retail investors. Loyal3 sells fractional shares and charges no fees to consumers, making money instead by advising companies on IPOs and follow-on offerings. Robinhood offers no-fee investing, generating revenue on interest from uninvested cash balances. Other services like Wealthfront and Betterment are designed to automate investing through low-fee, tax-efficient index funds. Is Shaq’s Next Slam Dunk an Internet Startup? By focusing on gift cards, Stockpile has a new way of entering that market. But it doesn't end with parents buying stocking stuffers for their kids or grandparents purchasing graduation gifts. Banks that don't have their own money management divisions are partnering with Stockpile to promote investing options for their customers. Technology Credit Union in San Jose, California, encourages its online clients to "get hundreds of top stocks with no age or account minimum." Another coming feature for Stockpile is the ability to turn credit card and airline rewards into stock. "A lot of us have points stacked up in loyalty programs without anything good to redeem them for," Lele said. Gift cards for hot tech companies are just the beginning, but they're proving there's a big appetite for easy-to-buy stocks.